As blissful as a warm beach day can be, it can also come with its own supply of stressors. Applying sunscreen evenly, finding a parking space, and generally ensuring that a swimsuit stays in place can all be enough to make our temperatures rise. So when sand happens to sneak its way into our freshly bought food, it's only natural that we tend to respond like a foghorn. Instead of waiting until you're steps from the waves to buy lunch—which is either stored in flimsy takeout boxes or open to the elements—pack a few items that can be easily stowed away until you're ready to eat. We've picked out 10 easy foods to take to the beach, complete with recipes that you can re-create with a little planning and a trusty cooler. Once other beachgoers see your delicious spread, they may wish for a seat under your umbrella. Why it works: Instead of packing two separate things—a tub of guacamole and a bag of tortilla chips—this recipe from Le Creme de la Crumb bakes guacamole seasoning into tortilla chips for a snack that's tasty and efficient. What to keep in mind: "I made these chips using both white corn tortillas and spinach flour tortillas," Tiffany says. "Corn tortillas will yield chips that more closely resemble the traditional corn tortilla chips you buy at most grocery stores. The flour tortillas yield a little bit different texture but are equally delicious!" Why it works: As it turns out, Tiffany at Le Creme de la Crumb has another recipe that works well for beach eating. Her mango chipotle chicken salad has all the makings of a filling lunch that can be stored easily in a big container or in individual jars. Just be sure to top the salad with a barbecue dressing when it's time to serve. What to keep in mind: "I tried this with barbecue sauce and a store-bought green goddess dressing and both were amazing! Either way, you can't go wrong," she says. 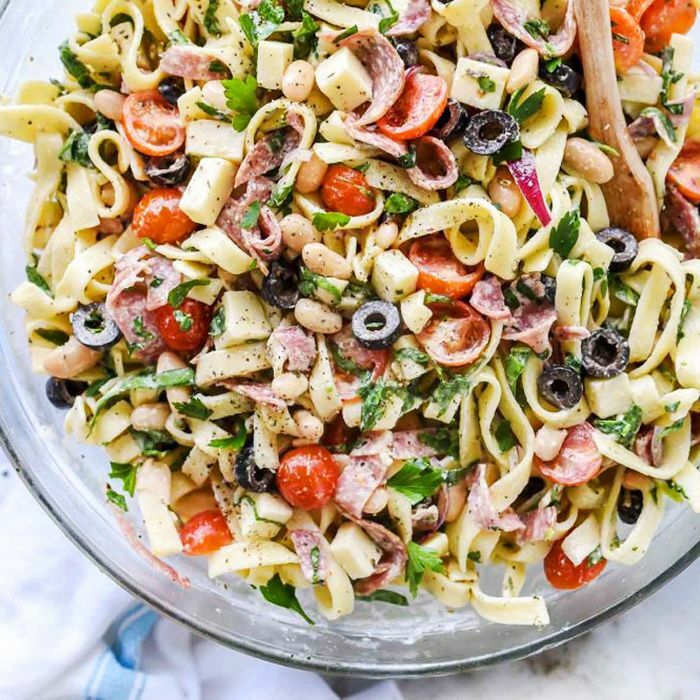 Why it works: Foods that can be eaten at room temperature (or a little warmer) are best for the beach, and that's why we're behind this Greek pasta salad from Spend With Pennies. Holly made enough to serve 12, too, which is perfect if you're beach-bound with a bunch of friends. What to keep in mind: Holly opted for a bottled Greek vinaigrette to top off the pasta, but you can also mix your own using red wine vinegar, garlic powder, olive oil, and oregano. Why it works: All it takes are six ingredients and 10 minutes to create these vegan dark chocolate fig oatmeal bites from the Butter Half, which is perfect if you're craving something sweet less than an hour before you head out the door. What to keep in mind: The bites have to be sealed in a container and chilled to keep their shape, so you should keep them in your cooler at the beach. Why it works: So maybe you'll have to do some planning to make Half Baked Harvest's oven-fried Southern chicken before your day at the beach, but it'll be worth it. Fried chicken tastes good warm or cold, which means that you can pack it for the beach without worrying about serving specifications (as long as you save the sauce for when it's time to eat). What to keep in mind: "The key is to soak the chicken in a little buttermilk before breading," Tieghan of Half Baked Harvest says. "The buttermilk tenderizes the chicken while adding flavor at the same time." Why it works: Foodie Crush's chipotle chicken taquitos are clearly going to taste good, but they also happen to not require utensils, or for that matter, plates. Put them all in a container and serve them from there—it's that simple. What to keep in mind: "I fried my chicken taquitos, but they are just as easily made baked in the oven. You won't get quite the same luxe and flaky crunch factor with the baked version, but you'll also be skipping the extra calories that come from frying," Heidi of Foodie Crush says. Why it works: While we're praising the Foodie Crush, we should also mention that Heidi's hummus veggie wrap is also a great food to eat at the beach. Not only is it handheld, but it's filled with healthy ingredients— spinach, cucumber, and alfalfa to keep you feeling light enough to go for a swim later. What to keep in mind: "I halve the cucumber instead of slicing it in rounds, then slice it lengthwise. It's one less veggie chunk to escape out the sides with each bite," Heidi says. Why it works: Fruit salad is easy to assemble, tastes good, and hydrates, too. We like this summer fruit salad option from Joyful Healthy Eats, which is so naturally sweet you don't even need dressing. What to keep in mind: Krista from Joyful Healthy Eats served her fruit salad in a large bowl, which is fine for eating at home, but for a day at the beach, it may be best to scoop this salad into individual jars. Why it works: This hearty sandwich from Half Baked Harvest features bacon, chicken breast, and lots of veggies between two thick slices of sourdough bread, making it the type of classic craving that's perfect for the beach—and it doesn't hurt that "California" is in its name, too. Sure, you might want to eat this as soon as you sit in your beach chair, but there's nothing wrong with that. What to keep in mind: Tieghan made sure that this sandwich has everything you need, including an unexpected crunch. "Finish with a handful of potato chips," she says. Why it works: Sometimes all you want to do is snack at the beach. And if you make this Greek tzatziki dip from the Wanderlust Kitchen, you can do just that. Mix together Greek yogurt, garlic, dill, and a handful of other ingredients, and then bring along your favorite veggies to dip in. What to keep in mind: Plan ahead and make sure to cut up the veggies before you head to the beach. Why it works: Who said beach food can't be elevated? This sophisticated chicken kabob recipe from Well Plated is still a simple meal to re-create, and it'll transport well if you'd like to watch the sunset on the sand. What to keep in mind: "For an extra layer of flavor, in lieu of plain chicken, I started with black pepper garlic marinated chicken breasts that I picked up from my local grocery store," Erin of Well Plated says. Next, brush up on your barbecue skills with these five amazing recipes.